Following this, chief coach Rashid Sidek tried to explain the losses by saying that Chong Wei had been on a hectic schedule. I want to ask Rashid Sidek whether he only came to realise this after the consecutive losses? Of course, Chong Wei had been on a hectic schedule, playing in almost all the open tournaments. 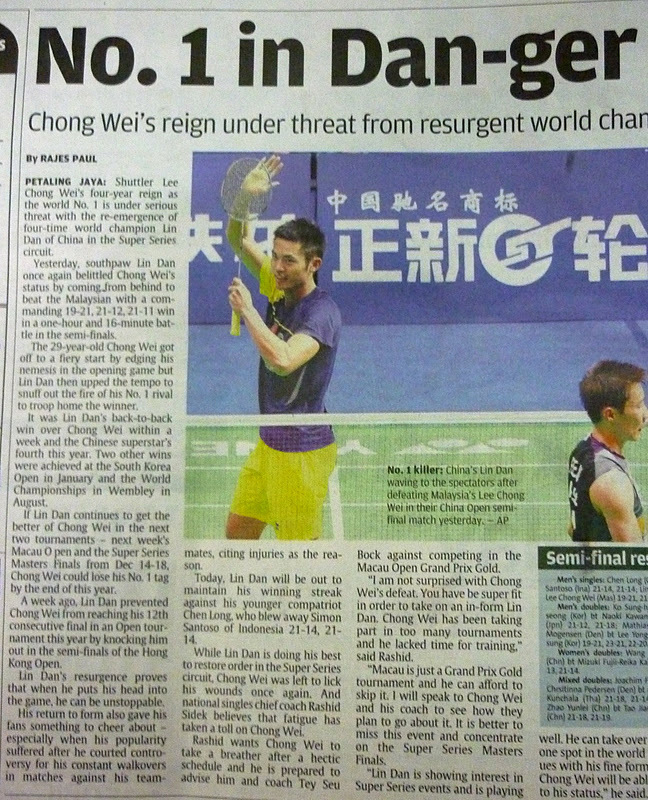 Why put Chong Wei to play in all the tournaments in the first place? Why couldn't we be a little more selective? Lin Dan himself only played in a few tournaments and each time he played he would get the better of Chong Wei except at this year's All-England tournament. Lee Chong Wei is the current world number 1 only because he has played in more tournaments than Lin Dan. 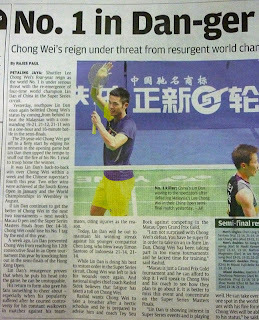 For me, I am not convinced that Chong Wei is the true world number 1 badminton player. I will only be convinced if he consistently beats Lin Dan and not the other way around. When we lost 2-0 to Syria in the recent Olympics qualifier in Bukit Jalil I had hoped that we would not use the excuse that our players had been tired from the matches in the Sea Games in Indonesia earlier on. But sure enough, that was the excuse used for the loss to Syria. I would like to ask whether the schedule to play Syria was given to us only after the Sea Games? Of course not. We had notice of it way in advance. So, why didn't we rotate the players? Now that we have just lost to Bahrain 3-2 in another Olympics qualifier match a few hours ago what excuse will we use?